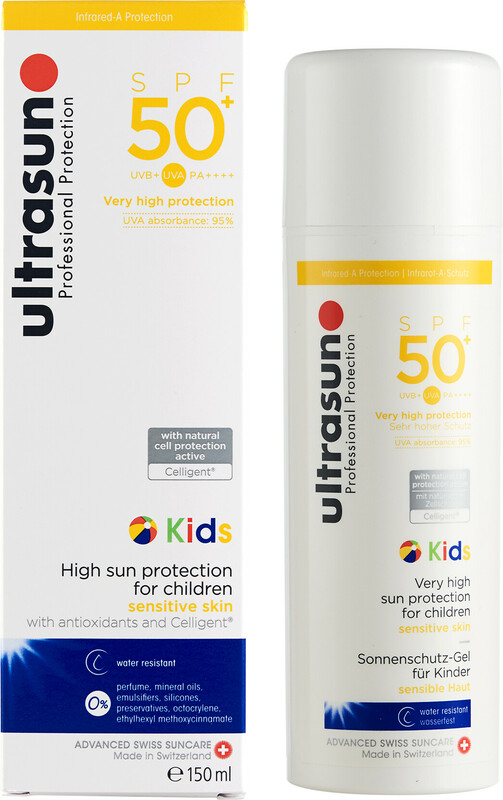 Shield your little one from the effects of sun damage with the Ultrasun Kids SPF50+, a very high sun protection for children from 3 years old. Fast-absorbing and easy to apply, the Kids SPF50+ sunscreen helps to protect the DNA of young and skin from sun damage and UV-induced skin ageing with Celligent®. Non-greasy and non sticky, this lightweight and water resistant gel defends skin with antioxidants and infrared protection. Infused with signature Ultrasun lamellar technology, a long-lasting agent that protects all depths of the skin, Ultrasun Kids SPF50+ prevents the onset of sun allergies and prickly heat. Apply generously and massage into clean, dry skin at least 20 minutes before sun exposure. Avoid the delicate eye area and any broken skin. Reapply every four hours for optimal sun protection benefits. Perfume-free, mineral oil-free, emulsifier-free, preservative-free, PEG/PPG-free, ethylhexyl methoxycinnamate-free, octocrylene-free, silicone-free, avobenzone-free, aluminium compound-free. Vegan.